Has anyone had any experience in this area and can they give me any suggestions to make this job easier? should have been typed "Frank"
Frank, I sent you some photo's, those two threaded holes do NOT have any studs in them and are NOT used. The Dellorto intake manifold is secured to the head with nine studs. The Zenith-Stromberg manifold uses six studs. All the heads have threaded holes for all the stud locations so that either manifold can be installed without further drilling & tapping. Coat both sides of the intake gasket with Hylomar Advanced Formula (aka, Hylomar Solvent Free). Smear on a thin coat (a flux brush works well), then use a paper shop towel to blot off the excess. Repeat on the gasket's second side, then on both the head and manifold mating surfaces. Assemble and tighten the nuts to 14-16 lbs-ft.
At the soft mounts, smear the O-rings with a light coat of the same Hylomar prior to assembly. Tighten Nyloc nuts until there is a gap of approximately a 0.35-0.50 inch (0.89–1.27 mm) gap between the coils of the Thackeray washer (aka, coil spring). Never tighten them until they go solid. If you're using the rubber grommets, use one cup washer between the Nyloc nut and grommet. Do not use two cup washers on a single grommet. Tighten the Nyloc nuts until the nut, cup washer and grommet all draw up snug against the intake manifold flange, firmly removing all the free-play/ slop. Then continue to tighten the nuts another 1 ½ turns each. Since the M8 nuts have a 1.25 pitch thread, 1 1/2 turns is equivalent to 1.88mm (0.074") of crush/ pre-load. Or eyeball-roughly 2mm (0.08”). Ensure that the V-grooves are the same width on all installed grommets. Never tighten until the cup washer contacts the mounting flange (ie, goes solid). There are lots of brands of aftermarket soft mounts available, most use plastic spacer plates, and they all use their own dimensions and O-rings. There is no one standard design. I don't know the specific O-ring dimensions for any of the aftermarket soft mounts, but it is important that you know which brand of soft mount you have, and buy the correct O-rings for it. The 'Lotus' branded soft mounts have a die-cast metal spacer plate with a tapered 'funnel' bore and an anti-reversion wave lip on the small side. The funnel needs to point downstream, toward the engine, so flow goes in the big side and out the small side. The early naturally aspirated Lotus soft mounts (non-turbo, and Jensen-Healey) used a thinner O-ring (all throat sizes use the same O-ring size). The later, 910 Carbureted Turbo soft mounts are different in that they have a wider groove and use a much thicker O-ring. A newer type of aftermarket soft mount consists of a thin, stamped metal plate with an integrally molded rubber "O-ring" around the center bore. It's a one piece part instead of the O-ring / plate / O-ring assembly. It's easier to handle, but thinner than the standard sandwich plate. Using one effectively shortens the inlet's overall length, changing the "tuned" effect. It's a small difference, but a difference if you're fussy about such things. Instructions for those soft mounts don't specify a gap for either side, they just say to tighten the nuts. On all of the above soft mount styles, the O-rings both seal the joint, and provide a flexible mount to keep engine vibrations from reaching the carbs. The carbs are not so much rigidly mounted to the engine as free-floating alongside of it. That provides a harmonic barrier that prevents engine vibrations from reaching the carburetor, causing the fuel to froth, and complicating mixture control. Never install the carbs without the soft mounts. Regardless of the type of soft mount used, NEVER tighten the nuts until the joint is solid. To do so would crush the O-ring and extrude it out of the joint in places, creating air leaks, and killing the intended vibration damping quality. When properly assembled, there "must" also be a uniform gap of specified width on both sides of the soft mount spacer plate (ie, between the carburetor mounting flange and the spacer plate, and between the spacer plate and the manifold flange). The width of the gap will vary by brand, and more specifically by the thickness of the O-ring used. Know what brand you have, and buy the correct size O-rings. 2) For the turbo engines (910 & 920), the gap should be 0.080" / 2.0 mm for the later, much thicker O-rings. I wanted to add this note: I just removed the intake manifold (ZS carrbs) from #18341. Eleven studs with nuts on all of them, including the two under the carbs. The car had valve work done some years ago - perhaps the garage that performed the work put the studs in those two? I was reading this, trying to remember since I just had my head off for reconditioning and new valves last winter. Clinton's sounds like mine (mine has Strombergs, just to be clear). Now that I read his writeup, I also specifically remember 11 studs and nuts. Those two underneath were a pain to get to, but they were accessible. If I remember right, what I did was to remove the other more accessible ones first, then loosened the last two while moving the manifold away from the head so that the nut had clearance to come off the stud. When reinstalling, same principle: I slid the manifold loosely in place, just enough to get those two "inaccessible" washers and nuts on and start the threads, then install the rest of the nuts and washers and finish tightening and torquing. 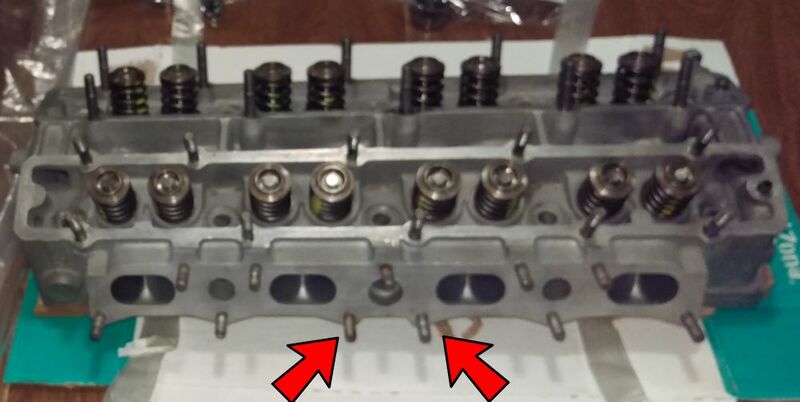 EDIT: found a picture of my cylinder head ready for installation, you can see all 11 studs with nice red arrows pointing to the two in question. The two in question are the ones under the round holes for coolant, they end up being partially blocked by the Strom's float bowls. Most JH engines don't use them, but if your willing to suffer I'm sure they can be used as you state. OK, I don't honestly remember which ones they were. This was a year ago and I don't remember what I did last week much less that far back. I just remember that two of them were very difficult to deal with because the stud extended too far and the nut would bump the manifold before coming off all the way. The solution was to gradually slide the manifold off the studs as I was loosening the nuts. They were all being used on mine, so I just went with the way it was. Plus, I had the engine out and on a stand during all of this which made it easier. It would be a serious pain to deal with this with the engine in the car. Yes, the hidden studs/nuts are the ones referenced by Brett - just under the coolant holes. And yes, I also had to remove all of the nuts except the hidden two, loosening those some and moving the manifold away before having the space to remove them - just as answerman says. Just to reiterate, these studs are NOT used by the factory. There have been no reports of leakage.